Want to recover ALL your chargeable hours? ALL your project material costs? ALL your project travel costs? Need project time tracking, expense tracking, and travel tracking for your projects? Need to track them accurately and with minimum overhead? Do you need to close the loop and raise invoices that reflect your actual costs accurately? Then our Time and Billing Software package, Timesheets MTS is for you! Timesheets MTS is ideally suited to ANY company or individual who provides services to companies and bills their time by the hour and needs to recoup their expenses. 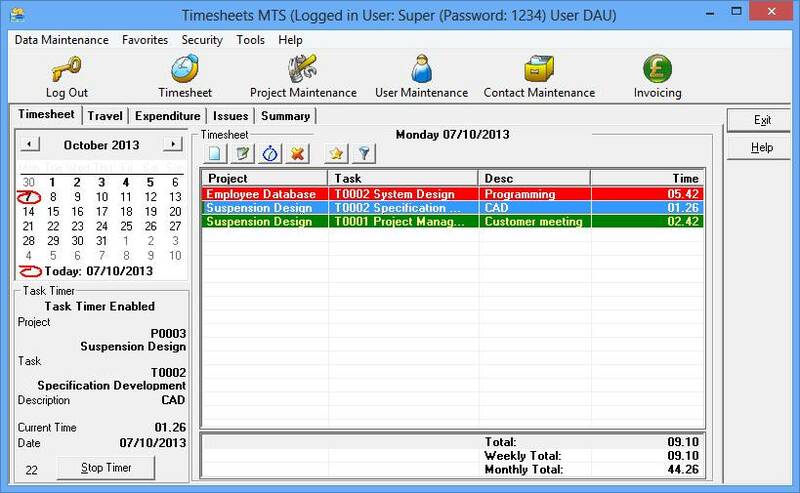 Timesheets MTS has comprehensive time and expense tracking facilities. It allows for different tax systems and includes your real cost (and profit margin) in every invoice calculation. In one low cost solution Timesheets MTS gives you more accurate time and expense tracking, more efficient billing, and a stronger bottom line! Bill by the hour, the minute, or configurable time unit. Setup your own employee structure and default charge rates. Extra flexibility provided by allowing you to define a different billing structure for each client or project. Timesheets MTS uses a concurrent licensing method, meaning you dont need to pay for each computer you install the software on, but only for the number of people you want to be able to use it at any one time. Our experience has shown that a 5 person company may only need to buy two licenses of Timesheets MTS!